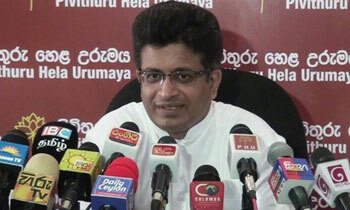 MP Udaya Gammanpila said today the diplomatic immunity of former Sri Lankan Ambassador to the US, Jaliya Wickramasuriya has been revoked for duties he had performed during his term of office and that this was the first such instance in diplomatic history. He said the Foreign Affairs Ministry had, on October 27 last year, informed the Sri Lankan Embassy in the US that Mr. Wickramasuriya’s diplomatic immunity has been revoked despite a prior assurance given to him. “The US government was requested to arrest Mr.Wickramasuriya on money laundering charges while he was undergoing medical treatment in that country. It is then that he had inquired from Foreign Affairs Minister Tilak Marapana on September 27 last year whether his immunity was revoked. On October 6, the Foreign Secretary replied saying his immunity was intact and that it has not been revoked. However, three weeks later, the ministry had informed our US mission that his immunity has been revoked,” the MP told a news briefing. MP Gammanpila said diplomatic immunity was usually revoked in cases of murder and frauds but not in instances of carrying out diplomatic duties. “Today, the government takes decisions bypassing the President. He only gets to know them through media. Perhaps he is not aware that Mr. Wickramasuriya's diplomatic immunity has been revoked. It is only the President could revoke the immunity. Therefore, he should pay attention in this regard,” he said. On January 5 this year, a warrant was issued for the arrest of Mr. Wickramasuriya as he had failed to appear in court when a case against him was taken up for hearing. Gammanpila seems to think that money laundering is part of the diplomats' duties! Another big fart from the foul mouth.Keep scoring for a future minister post under MR utopia government. A thief stands by another thief. Poor Brian Shaddick's money is spent in vain.